I thought I was gonna crash. The controls were mired in concrete. Heavy. Stiff. Unresponsive. The runway I’d just left rushed back up at me. The tail was crazy high. I pulled back, back, back—the yoke in my stomach. The engine’s drone changed to a high-pitched scream. Down low, in ground effect, right before striking the asphalt, her nose finally leveled off, then rose and we crawled into the sky like a wounded duck full of buckshot. Even with over 6,000 feet of runway to play with, there wasn’t enough left now to abort and put back down. I knew what had happened. I just didn’t expect the effect to be so dramatic. My speed mod failed to deploy. Instead of a slick aerodynamic fairing on my nose strut, I had an airbrake on the front of the plane. It didn’t help that the density altitude was over 9,000 feet—the hot, high-altitude air robbing my engine of performance and my wings of lift. So much for my best hope for speed. 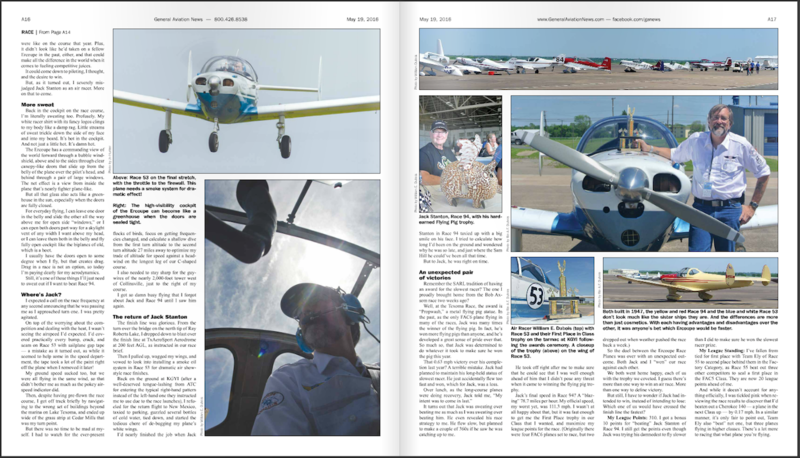 When we first joined the Ercoupe family, we quickly learned that it was a divided house. There were those who swore by the snubber cable, and those who swore it off. And this was no small disagreement. It was a holy war. WFT is a snubber cable, you ask? A fair question, and I’ll try to keep the answer short. 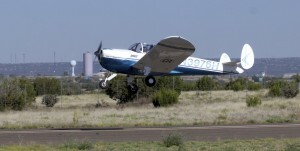 When an Ercoupe is on the ground, the full weight of the engine sits on the nose gear. 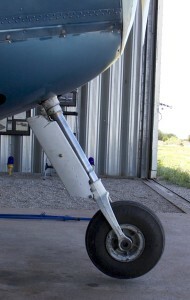 This compresses the landing gear strut. In the air, with no load on the nose wheel, the strut expands, lowering the wheel. No problem. Well, one problem. The only thing you can put on an airplane that’s worse than a cylinder is a brick. You’d think something round would be aerodynamic, but you’d be mistaken. Round objects create torrents of drag behind them that can actually slow a plane down. 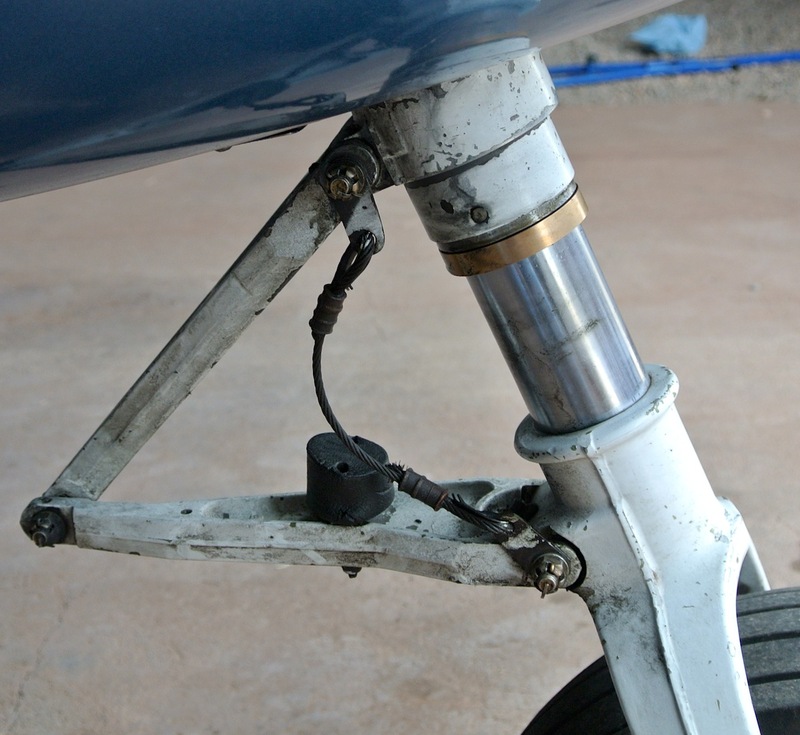 If you look at the support struts on a high-wing airplane carefully, you’ll find that they aren’t round tubes, they are flat ovals with tapered angles on the back to guide the air smoothly around and off the strut. When the Ercoupes first rolled off of the assembly line they had a cleaver folding nose strut fairing to reduce the drag from the nose strut. It was attached to a “scissors” assembly that opened and closed as the strut compressed or expanded. On the ground, the fairing rested behind the nose wheel, parallel to the bottom of the plane, like a miniature fuselage. In flight, the scissors opened and the fairing rose up behind the strut to guide the passing wind off the cylinder smoothly. It turned the drag-inducing strut into a miniature airfoil. It’s a splendid design. But there was another problem. 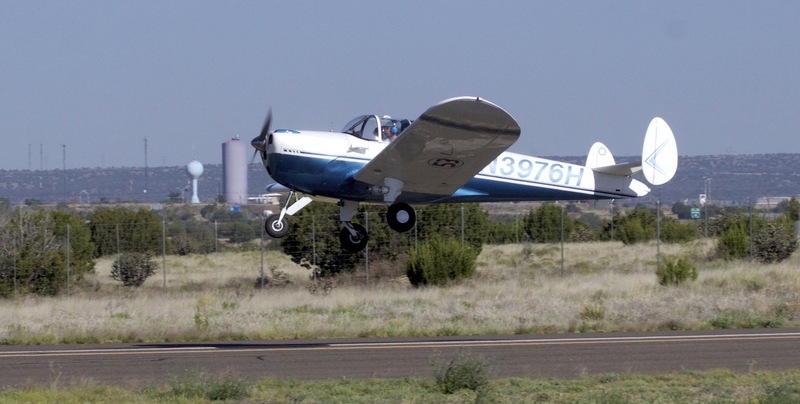 The nose strut on the Ercoupe is quite strikingly long. Almost like a mosquito’s proboscis. Apparently long enough to cause many pilots to touch down nose gear-first, which is bad news for the airframe, not to mention landing control. The solution to this problem was to limit how far down the nose strut was allowed to go, and thus the snubber cable was born. It’s simply a short length of tough steel wire that keeps the nose gear from extending very far. That solved the issue of nose gear touchdowns, but turned the speed fairing into a boat anchor, as it held the fairing in a half-deployed position. Accordingly, the fairings were removed from much of the fleet. But things didn’t end there. Ercoupe designer Fed Weick, a certified aeronautical genius if there ever was one, disagreed with the change. Rather vocally. He made careful measurements and revealed that the change robbed the plane of one full mile per hour in speed. And ever Ercoupe owners fell into two camps: Those who advocated (strongly) for the snubber cable and those who advocated (strongly) against the snubber cable. I was born snubber cable agnostic, The Plane Tales Plane had been converted to the snubber cable decades before, and it didn’t seem that big a deal to me. For most purposes, one mile per hour isn’t that big a deal. But in racing… Well, we’ve been making all kinds of mods to try to gain a second here, a second there. But buying an entire mile per hour is the racing equivalent of winning the lottery. Naturally, I decided to restore the original gear to the plane—a decision that would prove to be a speed mod too far. Of course, it wasn’t really as simple as I thought it was going to be, which is generally true of all things related to airplanes, and especially true of old airplanes. I thought we’d just need to remove the snubber cable and bolt the fairing onto the scissors and we’d be good to go. I found a fairing on eBay and ordered it, and showed up on my mechanic’s doorstep with a big box in my hands and a big smile on my face. I’ll spare you the odyssey of the next six weeks, but in the end we’d need to replace the entire scissors assembly with a different style, and even that turned out to be a disaster of mis-matched bolt sizes, washers, bushings—complete with filing, grinding, and other expensive actions. 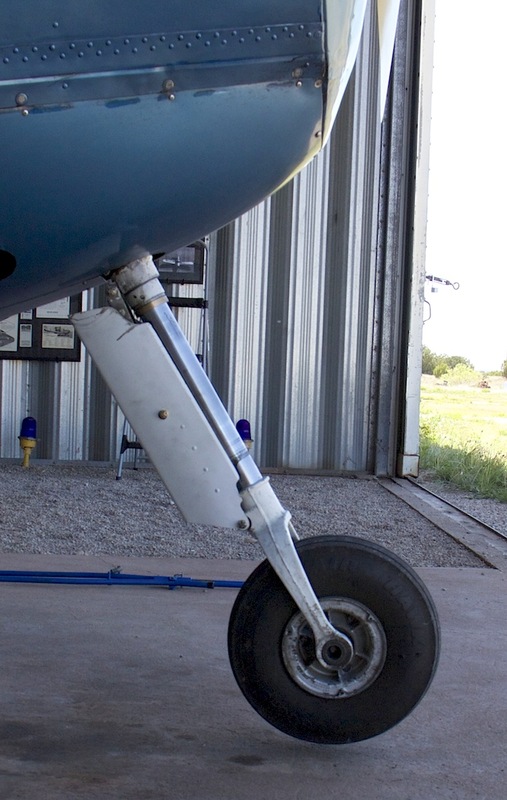 More than once the plane went to Santa Fe for the mod and came back with her old nose gear still on. But finally, just in time for a big race near Dallas the mod was installed. But there was a new problem. With the tail lifted, the nose fork didn’t extend properly. It had to be given a little tug. Which is easy enough on the ground, but it’s hard to get out and do it in flight. 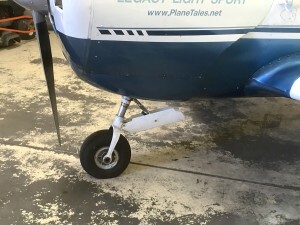 My mechanic couldn’t work out for sure what the problem was, but came to the conclusion that the gyroscopic forces of the spinning nose wheel would pull it down on takeoff. It was a reasonable theory. Back in the air (barely), although I couldn’t see it, I was pretty sure my nose strut was stuck half down. As we’d also talked about the possibility that the strut would loosen up after a few landings, I chose to tough it out and fly for home where I could post ground observers to radio me what they were seeing. It turned out to be a frightening flight. I have hundreds of hours in this airplane now, so I know her pretty well. But not this day. She was flying like a stranger. A bad-tempered, drunk stranger. When I got back on firm ground I crawled out of the cockpit and into a camp chair in the hangar, contemplating whether whiskey or rum was the best solution. Instead of either, I decided to get back on the horse that nearly bucked me off. With Lisa (who had driven over to the airport to rescue me) as ground observer, I took off again. This time the fairing deployed properly and the plane, while feeling different, was better behaved. But on landing, the extended strut stuck fully extended and I careened back and forth along the runway, nose crazy high. I decided to call it a day. But there was a race a week away, and a long cross-country flight to reach it. The next day I was back in the air, with both Rio and Lisa on the ground with radios and cameras, and another small video camera bolted to the belly transmitting wirelessly into the cockpit so I could see the nose gear in real time. We had mixed results. Once we got the fairing to deploy about 90%, and the handling and airspeed were excellent. Landing, however, was still dicey. Too dicey for the design. Beyond the deployment problem, something else was wrong. After our test flights, over chicken-fried steak and eggs at the Silver Moon near the airport, we looked at our data and images and came to the conclusion that we were suffering from not-quite compatible parts. Ercoupes have been around a long time. Over 75 years. In that time, the type certificate has been owned by a number of companies, each of whom made little changes. Sometimes newer parts fit with older parts. Other times they don’t. This problem is made worse by the fact that there’s really no way to know which version of each part is actually on your plane. The Plane Tales Plane just had her 69th birthday. We don’t even know how many owners she’s had in that time. Given more time, we could probably figure out why the strut was sticking and fix it. But time is at a premium right now. Plus, with me alone in the plane—with no cargo and light fuel—the drag from the partially deployed strut can nearly down the plane. I don’t want to think what would happen if it didn’t deploy with Rio onboard, along with cargo and fuel for 300 miles. Safety trumps the need for speed. I’d gone a speed mod too far. I picked up the phone and called my mechanic. It was time to slow down. Part 6 of Air Racing from the Cockpit just posted on the General Aviation News website. And if you’ve missed any part of the story, you can always go here to read the series from the beginning! 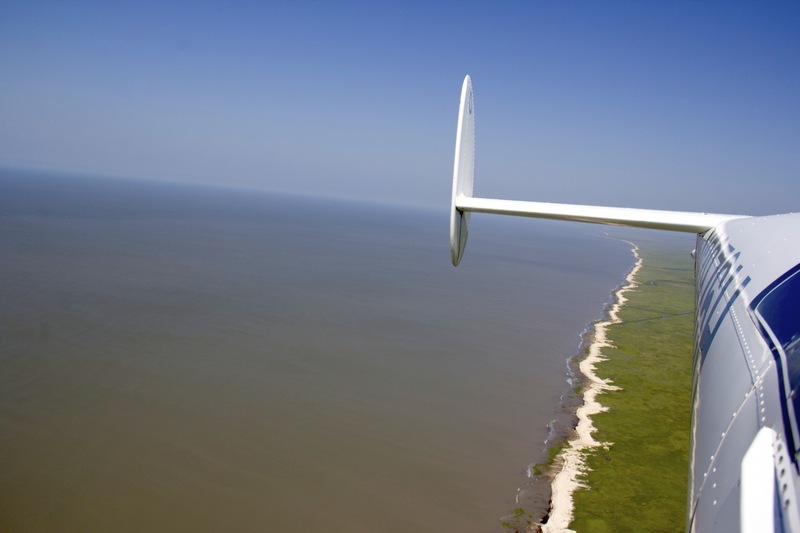 For the sake of safety, I chose a course that would overfly a spit of land between two massive lakes en route to the Gulf of Mexico. But looking down at the Louisiana wetlands as the ground slipped past a thousand feet below, I realized that “land” is a relative concept here. What looked solid on paper looked quite different from the air. The green expanse was riddled with brown-water lakes, ponds, and potholes; and the “dry” land itself was a green sponge—light reflecting off diamonds of water in every crook, cranny and crack. It was hard to say if the muddy water held more soil, or if the marshy land held more water. 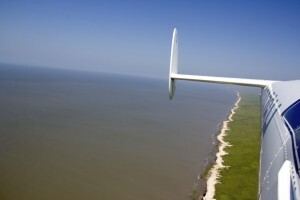 The original plan was to fly up the shore between Houston and Lafayette, but the Texas Weather Gods had shredded those plans two weeks before when the race around Galveston Island was scrubbed. Instead of a short, leisurely cruise up the beach, Lisa and I had to fly for ten hours over dry land to get to Abbeville for the Race For Heros. But Lisa still had gulf water in her veins and in her mind’s eye, and wanted to see for herself what that great body of water looked like. As it was only 30 miles away, our work for the day was done, and we had plenty of fuel, I pointed our nose south. Civilization dwindled and disappeared. Channels, canals, and waterways replaced roads. 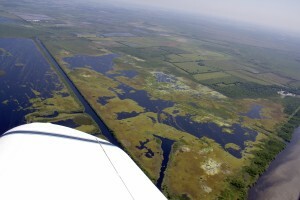 The flat marsh extended as far as the eye can see in all directions. Finally, at the far end of the green expanse, a ribbon of yellow-white beach separated the edge of the continent from the sand-colored costal waters of the gulf, where crisp white breakers, like froth on a latte, lapped at the shore. After a long flight it was time to relax. We did lazy “S” turns back and forth across the desolate beach at 700 feet, venturing out with nothing but air and water under our belly, then turning back again over the marsh, then once again out over the ocean, our plane an over-sized shorebird stretching her wings in the morning light.